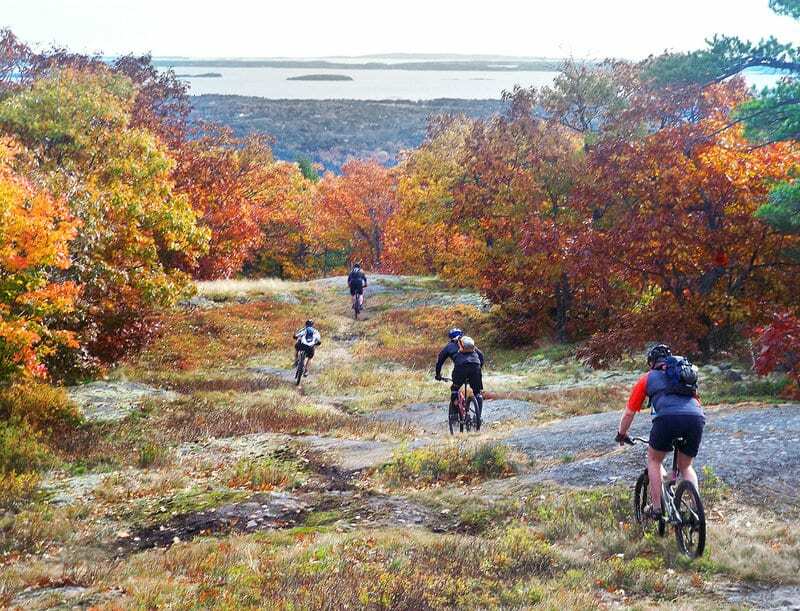 The Camden area is a wonderful place to go mountain biking. It’s packed with locally-owned shops, art galleries, hotels, inns, bed and breakfasts, and is a culinary mecca to foodies. Surrounded by tremendous natural beauty, Camden is the stating point for a variety of outdoor adventures — hiking, sailing and paddleboarding, skiing and snowboarding, camping and of course, mountain biking. The Snow Bowl serves as the parking area and trailhead for the Camden Snow Bowl and Goose River trail bike networks. This machine-built, hand-groomed trail is a spectacular downhill experience. Aside from 2-3 short steep sections, it’s all flowing berms, rollers and table tops. It has a few rock and wooden features for expert riders, all of which have bypasses for the less brave among us. Most of the trails at Camden Snowbowl are fairly rugged, with plenty of rocks and roots. Dreadnought is a notable exception, constructed with the feel of a lift-accessed park in mind. To get to the start, you have to either tackle a 20-30 minute rooty and windy climb, or show up on one of the lift access days sprinkled throughout the summer. The trailhead is adjacent to the top of the lift. More information about the Dreadnought Trail. If there is a function at the lodge, please be courteous and ride well away from the activity on the lawn. These trails are multi-use so be careful if you encounter hikers. Please stay on the trails and do not leave any trash. No motorized vehicles are allowed on the trails or ski slopes. Dogs are allowed and Town ordinances require that you pick up your dog’s waste. There is a Mutt Mitt dispenser at the trails kiosk, as well as on trees in the parking lot and near the trail head. Many bikers enjoy a swim at the boat launch in Hosmer Pond after their ride. There is a port-o-pottie at the ball field. If you’re biking in the early morning or near sunset, don’t forget to bring your bicycle lights.